For the past few years that I’ve penned this column, I’ve kept it light and fluffy. It’s called The Frivolist after all, and my goal is to entertain with innocuous content that focuses on the fun stuff in life. I’ve written about movies, music, fashion and fitness here – all of which, in the grand scheme of things, are rather inconsequential. Fifty of our LGBT “family” members were gunned down simply for being LGBT, along with another 50-plus injured, and in reflection of June 12’s early-morning events I didn’t think it appropriate to use this space to reveal the latest summer gadgets. Instead, I’m using my editorial allowance this time to dissect the aftermath of the largest mass shooting in U.S. history and our loved ones’ reaction to it; the response by the media; and how we, as a unified people, must take a stand to tell those who oppress us that enough is enough. We are in this together until we are not, and that fate should never be up to another human being. Thus, here are a few bitter pills to swallow if you don’t want to be a statistic. Sane people don’t walk into a nightclub with a capacity crowd in the middle of the night and open fire a la Tony Montana. Yet the three major talking points on both mainstream and social media following the massacre were gun control, terrorism by Muslim extremists and lax immigration laws – even though the latter is moot because the gunman, who I will not glorify by name, was born in the United States. We must start addressing our country’s epidemic of mental illness, no matter how difficult the conversation is, so we can effectively diagnose and treat it before it’s too late. That’s not to say that the other soapboxes are irrelevant – they aren’t – but mental illness played a part in this tragedy, and we can’t keep brushing it under the rug. It’s not hard to find an American member of the clergy who has at one time or another – maybe during a Sunday sermon or perhaps in a video that’s surfaced online – called for the condemnation and, in some cases, execution of LGBT people. They exist. Despite their seeming abundance, however, they’re relatively few in numbers, and they’re often viewed as fringe members of the religious community. Who we should be more concerned about, however, are the elected officials who we’ve put in power that are facilitating a deep-seated disdain and hatred toward LGBT people and other minority groups. People like the Trumps, Ted Cruzes and Dan Patricks of the world are a problem, and they cannot be absolved of their bloodstained rhetoric any longer. If gun reform is important to you, push your issue with policy change. Updating your status about how this never would’ve happened if AR-15s and similar assault weapons weren’t readily available and legal to obtain makes zero difference – especially to those who have been and will be buried by their families because their bodies are full of bullets. 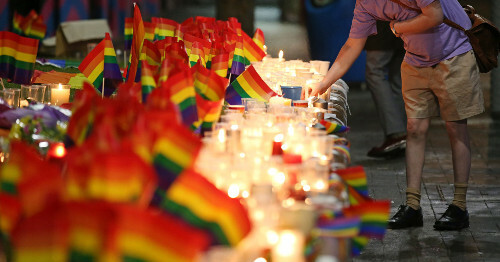 You might have noticed something disturbing the day of and after the Pulse nightclub attack: Your LGBT friends and allies mourned this tragedy while much of the rest of your network either remained silent or skirted the issue of decades of villainizing our community. If they did have an opinion, it was about guns and Muslims and terrorists. This in itself should be a wake-up call to you that you know and love people who do not care if gay people are murdered in mass – and you need to start separating yourself from their deadly ideology. Dan Savage’s rainbow-tinted “It Gets Better” approach to LGBT discrimination helped ease our pain a few years ago when LGBT suicide was a top story in the news cycle, and while that nonprofit marketing gimmick wasn’t even true back then, it’s practically nonexistent now. No matter how much progress we make in terms of legislation for our civil liberties, the conservative right and its radical cohorts continue to establish us as demons. As a result, there are proverbial bounties on all our heads – and we need to get our heads out of our asses about it. We are Orlando; this could’ve happened to any one of us – and if we don’t wise/rise up, it will. You don’t need to apologize for who you are anymore. Like, ever. If somebody doesn’t like who you are because you’re gay, lesbian, bisexual or transgender, that’s their problem, not yours. Stop apologizing to your relatives, friends, coworkers and pastors. You don’t owe anybody anything, but you should start demanding respect. Otherwise, cut them out of your life. Their political and religious views are poison, and it can kill you. There’s no end in sight for America’s scourge of mass shootings. It will happen again and again and again. And until every assault weapon is melted down, you are in danger. If the government won’t protect you, you have to protect yourself – and step one is enrolling in a course on how to survive a mass shooting. They’re growing in abundance, because, well, that’s our reality now, and it’s in your best interest to be prepared. Your life may depend on it.